Indian paintbrush is one of my favorite native wildflowers to see hiking, and one of the more unusual plants in any of our gardens. It is a hemiparasite, meaning it takes nourishment from a host plant but also photosynthesizes for itself. To grow it, you have to germinate the seed and then put it in a pot with another plant and wait for them to join root systems; when I read about the process, it sounded like a huge pain in the neck. Now that it’s established, though, it’s really carefree, growing with an Artemisia californica in some of the heaviest clay soil we’ve ever planted in. The two plants have similar foliage, so you don’t notice the paintbrush for much of the year, but then the blooms pop out from under the shrub and carry on for a long time before fading back and going dormant for the winter. We got the plant at the Watershed Nursery, the only nursery I’ve ever seen selling it, and, in our experience, the best source for natives in the area. East Bay Nursery and Berkeley Hort and Annie’s Annuals are all good for natives, too, but they mostly sell cultivars and their plants come from all over the state, not really “native” in the purest sense. The Watershed Nursery, on the other hand, sells Bay Area natives, grown here in the Bay Area from seed collected here in the Bay Area. If you want to plant the same plants that you see when you’re out hiking, it’s the nursery to go to. The paintbrush came in a gallon pot with the artemisia, but the Watershed Nursery grows most of their stock in restoration tubes. Restoration tubes, if you’ve never used them before, have some advantages over the typical gallon pots you find in the typical retail nurseries. Compared with a gallon-sized pot, it takes less time for the plant to fill the narrow tubes with roots, so the plant will cost less while still getting its roots just as deep in the ground, and the plants haven’t spent as much time in potting soil, so they are quicker to adapt to whatever soil you plant them in. The tubes have vertical ribs to keep the roots from girdling, and they are open at the bottom so the roots air-prune instead of circling the bottom or heading back up to the top. You don’t have to spend as much time undoing a root ball, so you can plant a lot more quickly, and you don’t do as much damage to the roots, so the plants establish themselves almost immediately. The plants look small when you first plant them, but they often seem to explode out of the ground. I’ve recently been passing by several yards where we planted a lot of Watershed Nursery plants, and they’ve all been looking big and healthy and happy. They have a sale every year during the upcoming Bringing Back the Natives Tour. The Kew seed slideshow has a cool photo of an Indian paintbrush seed. This entry was posted on Tuesday, April 14th, 2009 at 1:20 am and is filed under california natives, plants, wildflowers. You can follow any responses to this entry through the RSS 2.0 feed. You can leave a response, or trackback from your own site. You should ask the folks at the Watershed Nursery. They are really nice and helpful. It’s out of my league but definitely doable, I read a pdf once; I think you have to cold stratify it and you don’t get a high germination rate and then you have to get it into a pot with another plant fairly early. The Watershed grew it with artemisia and mimulus because it was growing with those where they collected the seed, and it did better with the artemisia. I’ve heard of people growing it with festuca californica or other bunch grasses. Once it’s in the ground it’s really easy. Might be fun to try; if you managed to grow it, you’d have serious bragging rights and it is really pretty. I’ve only found plants a couple of times locally in restoration tubes, but after planting natives that way, I’m hooked. I like the combo of lower price and ease of getting them established. And cool paintbrush, BTW. It’s one of my favorites too. I hadn’t known Indian Paintbrush was a hemiparasite – good news, since it’s one of my favorite wildlings and I’ve had no success in getting it to grow. Speaking of growing things from seed: JL Hudson catalogue (or website) often gives very very detailed descriptions of how to germinate seeds, many of them natives. And also, you can try observing the natural environment a plant lives in, and duplicating that. If you live near the plant, just spread seed in fall and let it work – only of course that doesn’t work if the plant is a hemiparasite! Watershed Nursery sounds great, I’ll have to check it out next time I am in the East Bay. Thanks for an informational visit! 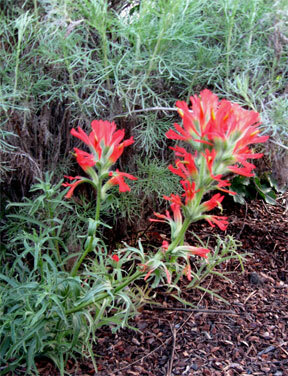 I also grew up with Indian Paintbrush, It grows all over the B.C. interior in Red. The year my father died it was blooming and my brother in law created a huge bouquet arrangement from the arm loads of flowers we collected from the lake property we have. It seemed a fitting tribute to my dad who loved spending all the time he could at the lake. That’s a great flower arrangement and tribute. It must have looked amazing. We only have one in the garden, so no chance of cutting armloads. I’m pretty excited about this because where I live paintbrush and artemesia and – various other pretty natives including monkeyflower and clarkia and lupine – all grow natively on a steep sunny hill that faces west. I’m hoping I can propagate them now. Thanks! Thanks for this post! I’m growing Paintbrush now at home – since I came upon a viable local population from which I could take a few seeds – it’s growing on a road-cut. I take seeds from road cuts without compunction (but of course only a few) because road crews are usually at my back scalping said banks within a few weeks with their big machines. So I was glad to read your account of success. I’m having decent results in this “pilot” project and will grow more next year, all being well. I posted about it – Nov. 2015 and Early May 2016 if you’re going looking later. I’m also thankful for your comments on the tubes. I really have to grow that way! It seems to make so much sense!